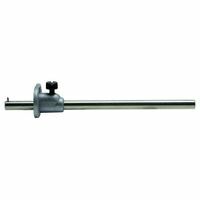 Delivers accurate measurements up to 1/32". The stainless steel body delivers both Metric and English readings of inside and outside measurements. There is also a decimal equivalents chart printed on the back side for help with calculations. Etched and filled black graduations. General Tools Vernier Caliper, Graduations: 1/16 in, Metric and English Display, 11.62 in Overall Length, 3-3/4 in Overall Width, 1/2 in Overall Depth, Solid Steel, 3.4 oz Weight Made of ground stainless steel for optimum accuracy. Permanently etched graduations from 0 degree to 180 degrees in opposite directions. 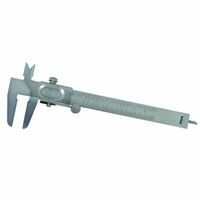 Adjustable 6" protractor arm locks into desired position with knurled thumb nut with 3-3/8" x 2" head. Satin chrome barrel and thimble with etched black graduations. Ground and polished carbide measuring faces. Spindle lock for repetitive measurements. Guaranteed accuracy to .001". 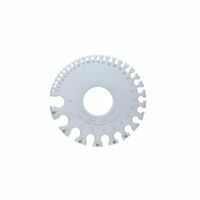 Used in applications such as hobbyists and do-it-yourselfers or in machine,tool and automotive shops. Includes: spanner wrench for simple zero adjustments and a decimal equivalent chart. 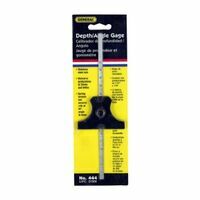 General Tools Sheet Metal Gage, Round, 0 - 36 in, 3-1/4 in Diameter, 3/32 in Thickness, Steel, Satin, Includes: Decimal Equivalents, U.S Standard, For Gaging Uncoated Sheet Metal, Plate Iron and Steel Displays absolute and relative angle measurements in a large, easy to read LCD window. 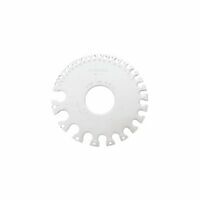 Offers a hold function and can be inverted 180 degrees for easy reading when the tool is upside down. 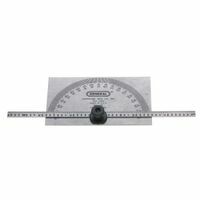 Features a 6'' (150mm) stainless steel pivoting protractor arm with a knurled locking nut and one button zero calibration, to ensures accurate readings. Adjustable Trammels used in marking over large distances, tracing contours and scribing circles. The 6" scribing points are adjustable, and can also be replaced with pencils, pens, crayons and soapstone for marking various surfaces. The heavy-duty clamps will fit 5/8" to 1-1/2" beams of any length. 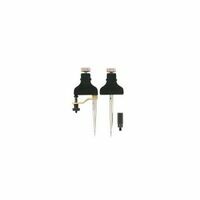 Set includes: (2) two trammels and (2) two 6" scriber points. Three universal systems of measurement. The high-contrast digital display easily switches between inches, millimeters and fractions, with guaranteed accuracy to 0.001". In addition, the rugged stainless steel design delivers accurate readings of inside, outside, step and depth measurements. Flashing display indicates low battery. Includes: a foam padded plastic case for safe storage when not in use. 72 built-in scales for more versatility, 39 imperial (feet-inch) and 33 metric; 6 custom scales, 3 each for imperial and metric units, lets you "roll" or define any scale from plans that have been reduced, enlarged, faxed or otherwise out of scale; calculate area, volume, height, length, width for imperial and metric units; manual count while rolling for studs, piers, outlets or other items; subtract function to remove the last distance measured; includes 2 long-life 3-volt batteries, hard cover protective case, English user guide, multi-language available on corporate website; ideal for contractors, landscapers, electricians, estimators and anyone needing fast, accurate takeoffs from plans and blueprints.